The battle over the massive Ahmanson Ranch housing development heats up amid growing concerns about possible water and soil contamination from nearby Rocketdyne. July 1959. Eastern Ventura County. Simi Valley folks squirmed uncomfortably in their chairs as they watched their flickering black and white television sets. They stared in nervous awe as Soviet Premier Nikita Krushchev and Vice President Richard Nixon toured a Moscow exposition of a model American home. When the pair paused in the kitchen, they erupted into a bellicose argument. “We have means at our disposal which can have very bad consequences,” Krushchev hollered through an interpreter. “We have too,” Nixon countered. “Ours are better,” Krushchev shot back. The image of the two leaders threatening each other in the comfy setting of American-made appliances—the legendary Kitchen Debate —brought home the deadly seriousness of the Cold War. No one knew at the time that events unfolding on a picturesque hilltop just five miles from town were bringing the grim reality of that era even closer. On a 2,668-acre complex covered with boulders and blanketed by chaparral lay Rocketdyne’s Santa Susana Field Laboratory (SSFL), a giant semisecret expanse of rocket test stands, concrete bunkers and nuclear reactors. The laboratory was intricate in developing America’s arsenal of intercontinental ballistic missiles including the nuke-tipped Minuteman rocket. The work going on at the laboratory was one of the reasons that Nixon could confidently stare down the Soviet premier. What nearly no one knew in Simi that hot summer night was this: a primitive Rocketdyne nuclear reactor, the Sodium Reactor Experiment, was in the throes of a meltdown. Nearly a third of the reactor’s core melted and slopped onto the floor of the core and radioactivity spewed into the environment from the unconfined building. The disaster, which wasn’t acknowledged until five weeks later, would forebode the continuing problems that Rocketdyne would have in handling radioactive and toxic materials for decades to come. That same year a fuel rod exploded at the lab while being washed with water, flooding a reactor with radioactivity that was vented outside. In 1960, a reactor pipe that was being moved outdoors for decontamination exploded and flew across a ravine. The facility would also experience another catastrophe in 1964 when an experimental space reactor melted down with eighty percent of the nuclear fuel melting and radiation escaping into the environment. Now, fifty-four years after Santa Susana opened in 1948, America’s third largest bank, Washington Mutual, is attempting to complete plans to build 3,050 luxury homes, two golf courses, and 400,000 square feet of commercial space on 2,783 acres within three miles of SSFL. Critics have long assailed the proposed Ahmanson Ranch project since it would develop the largest remaining privately owned land between Ventura County and the San Fernando Valley. They decry what they claim would be a traffic congestion nightmare and have voiced concerns over the endangered California red-legged frog and the San Fernando Valley spineflower found at the site. 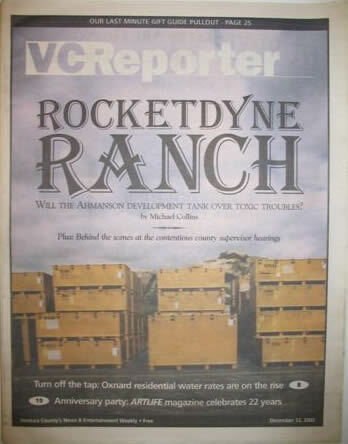 But recent revelations regarding chemical and radiological pollution at the site possibly emanating from Rocketdyne’s adjacent lab have come to the forefront in the battle over Ahmanson Ranch. Trichloroethylene, or TCE, is a carcinogenic solvent used to clean rocket engine hardware. During the ‘50s and ‘60s, approximately 1.73 million gallons of the solvent were sluiced into unlined ponds and about a third of it has made its way into the groundwater under the laboratory. Rocketdyne vigorously denies that any hazardous levels of the goo has migrated offsite. “The farthest we found is about 800 feet off our property,” said Steve Lafflam, Rocketdyne’s division director for safety, health and environmental affairs. The Ahmanson Ranch endgame saga began June 19 when Dennis Hawkins, senior planner for Ventura County, told a planning board meeting that he would instruct sub-contractors to check for pollutants in the groundwater under Ahmanson Ranch possibly emanating from SSFL. That heavily polluted site is now undergoing a $258 million dollar cleanup due to radioactive and chemical pollution resultant of half a century of rocket tests and chemical and radiological mishaps, releases and spills. The test results were shocking. The rocket fuel oxidizer, perchlorate, was found to be 14 times over what California currently considers safe for drinking water. One well tested positive for perchlorate at a level of 28 parts per billion (ppb). On Dec. 6, California’s Office of Environmental Health Hazard Assessment lowered the public health safety goal for perchlorate from 4ppb to 2ppb in response to growing alarm over the oxidizer’s toxicity. “Perchlorate disrupts how the thyroid functions,” according to the Environmental Protection Agency (EPA). “Impairment of thyroid function in expectant mothers may impact the fetus and newborn and result in effects including changes in behavior, delayed development and decreased learning capability. Changes in thyroid hormone levels may also result in thyroid gland tumors.” No studies have been undertaken to determine the hazards of breathing in airborne perchlorate or it’s effects due to skin exposure through contaminated water droplets. Last week, it was revealed that perchlorate has been found in 18 wells in Simi Valley. The highest reading was 19.2 ppb, nearly ten times the new allowable limit of the powdery white substance in California drinking water. Perchlorate has been found in a former sodium burn pit at SSFL and was disposed of in the eastern part of the laboratory where munitions and propellant testing took place. Readings as high as 600ppb have been found in that eastern area of the lab. Rocketdyne has said that there is no evidence that perchlorate has migrated offsite towards Simi or Ahmanson Ranch and has suggested that children playing with fireworks may be the cause of the pollution. Also found in the recent ground water was antimony, a silvery-white metal that exceeds the government’s “maximum contaminant level” by 766 percent. Antimony in the air attaches to very small particles that may stay in the air for days, according to the Agency for Toxic Substances and Disease Registry. “Breathing high levels for a long time can irritate your eyes and lungs and cause heart and lung problems, stomach pain, diarrhea, vomiting, and stomach problems,” an agency document states. “All samples collected during July were decanted prior to analyses,” the report continued. “Some samples were also filtered.” Bewildering as this data may seem, the information clearly seems to suggest that tests of the Rocketdyne groundwater may have been machinated in order to hide the possibility that SSFL’s groundwater may be seriously contaminated by radioactive substances. Obtaining the SEIR’s information has been hard to get in general. When the 4,000 page report, weighing 56 pounds, came out in September, it was available in hard copy for $1,000. Public agencies, organizations and individuals who submitted substantive comments on the Public Draft Supplemental EIR were sent free CD-Roms of the SEIR but the discs were defective and missing vast chunks of information. Senior planner Hawkins then sent out a letter informing the recipients that they could call him or e-mail him for a new disc. However, the e-mail address in the letter was faulty. Then the second batch of CD-ROM’s finally were sent and they were faulty as well. Over a month ago, this reporter called Hawkins and requested a disk. Hawkins said that he hadn’t any more but if I sent him twelve dollars he would send me one. I sent him the twelve dollars on Nov. 7. I still haven’t received the CD-ROM and have had to rely on numerous sources to get the parts of the truncated SEIR to report on this story. Ahmanson Ranch seems to be a metaphor for the challenges facing Southern California. We need new space for housing, as this reporter was told by the former Mayor of Los Angeles, Richard Riordan. We need new space for folks trying to make a living servicing those people who could actually afford those prospective manses in the pristine hills that are Ahmanson Ranch. But at what cost? Shall it be polluting the environment because a big bank needs to make its nickel back or should it be in the interest of the people of Ventura County and the San Fernando Valley? The decision that the Ventura County Board of Supervisors makes this month will last long after all of us are forgotten. 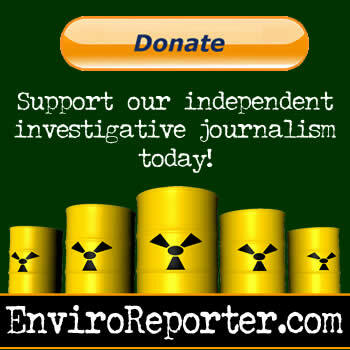 Michael Collins is an award-winning investigative journalist specializing in environmental issues. He has reported extensively on Rocketdyne for Los Angeles magazine and the L.A. Weekly newspaper since 1998. Collins was recently elected to become a Director of the Greater Los Angeles Press Club for a two-year term beginning in January.